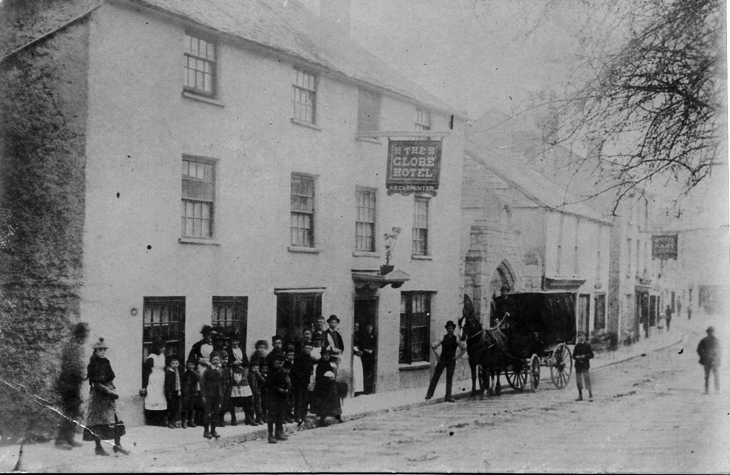 In Chudleigh the school for boys and girls started properly in about 1813 and was co-located with the parish workhouse in Fore Street, opposite the church. The method of teaching was referred the Madras System. This system of education was so named because it had its origins at the Military Male Orphan Asylum, Egmore, near Madras. It was also referred to as a National School. The definition of a National School in England and Wales was a school originally established by the National Society for Promoting the Education of the Poor in the Principles of the Established Church in England and Wales. That society was founded in 1811. The old workhouse building in Fore Street that housed the fledgling school was demolished in 1818 and a new building erected to house the new National School and the workhouse inmates. In that year the Parliamentary Return of educational establishments stated seventy Church of England pupils were in attendance at the school. By 1838/39 (when the paupers had moved to the newly built Newton Workhouse) benefactor John Williams (of Elm Grove, now Swanston House) purchased the property from the parish and updated the school accommodation entirely at his own cost and allowed continued use completely free of charge. It consisted of a schoolroom for boys, one for girls and one for infants. There was also accommodation for the mistress. In the later 1830s, the Headmaster was Mr Henry Brown, the Mistress Miss Mary Martin and the Infants Mistress Miss Mary Hoare. From 1840 the Master was Mr William Shamler who was replaced by the returning Henry Brown in 1849, At that point Mr Brown with his wife and children were living in a cottage Pottery Way, probably one of those owned by the parish. At about that time the Infants Mistress was Miss Mary Widdicombe who resided in Mill Lane. She was replaced in 1857 by Miss Mary Lowry. In that year the average attendance was said to be sixty-six boys, forty girls and forty infants. The Endowed Charities report cited the school in 1857 and ends its report by stating 'the income of the Poor's Charity or Parish Lands (Church House) and Eastchurch's Charity was applied for the benefit of this school which is the public elementary school for the parish'. It also stated 'Before 1896 for many years the whole income (Eastchurch's) was paid to the Church School'. In that year and subsequently the income was divided between the Church and British School (the Baptist school), and in 1905 half was paid to the LEA and the other half was divided between the three Sunday schools of the town. Miss Mary Martin (the girls Mistress) lived in Culver Street but in 1858 when the boys and girls moved to the new Fore Street premises she moved to the old location and supervised the infants until they moved in 1860. She then retired and moved to a cottage at Wych where she died in early 1871. In 1858 the new school premises were completed off Fore Street (now housing the library and youth club) with a separate headmasters house. The cost has been stated variously as £1200 and £1500, and apparently paid through the benevolence once again of John Williams and Sir David Dunn of Rocklands, who died one year later on 16 June 1859. The new building could accommodate 333 children – 140 boys and 108 girls. The infant department was completed in 1860 accommodating eighty-five children. All three schools were still supported wholly by voluntary contributions. Headmaster Mr Henry Brown departed for Scotland in the summer of 1857 having served the school for almost fifteen years. Mr Brown's replacement was a Mr Pope who had left by early 1861. A year earlier the infant department was completed. It continued as a separate department until amalgamated with the mixed school in 1938. The new Headmaster was Mr William Rapsey, his wife Sarah being the girls Mistress. They occupied the detached masters house but did not stay long. Later in the year they were replaced by Mr John George Mabey who held the job for the next forty-four years. Not long after he started the keeping of school log books commenced (1862). He was born in 1841 at Rottingdean, Sussex and came to Devon with his parents, Solomon and Joanna Mabey (his father was a coastguard) where the family settled initially at St Marychurch.Torquay. Mr Mabey's sister Mary Jane Mabey had come to Chudleigh by early 1861 and was in service at Culver House for the Yarde family. Not long afterward Solomon Mabey retired and he and the rest of his family came to the town bringing their son George with them. George Mabey had carried out his teacher training at St Lukes, Exeter. He married at Torquay in 1877 to Elizabeth Shepheard Edgecombe. He formally retired on pension at the end of September 1905 and lived at Hurstbourne, Parkway Road. In 1907 he temporarily took charge of Bovey National School whilst the master was away training for holy orders. He died on 31 May 1928 aged 87, his wife had died three years earlier. Whilst he was at Bovey Tracey the Chudleigh School was put in the care of Mr Joseph and Mrs Caroline Gale, in 1901 they had been in charge at Hennock School. By early 1871 the school was able to accommodate a total of 461 children. In 1876 attendance was made compulsory. The Boys and Girls schools were amalgamated in 1877 and at this point the school was referred to as formerly the National School. In 1880 an arch was built at the Fore Street school entrance (adjacent to The Globe) with a gas lamp at the top. This arch was still in place in August 1959 when the council received a complaint from mothers waiting for their children; although not stated in the Mid-Devon Advertiser item, it is assumed the wish was for it to be demolished. The arch was removed in the early to mid-1960s. From about 1896 one of the mistresses was a Miss Ethel Magrow. She taught for about twenty years and left on marriage to Mr James Blackmore. They moved to live at Dover where she passed away aged only thirty-one years in February 1907. Under the 1902 Local Education Authority Act the schools continued as Voluntary Church Schools and given controlled status in 1952. In the October of 1905 Mr. Fred Jones became headmaster. He had previously held the head-assistant-master post at Wolborough School and seems to have followed Joseph Gale the headmaster at Chudleigh since Mr Mabey's retirement. He remained at Chudleigh until the summer of 1912. He then moved to Pinhoe near Exeter where he took the job of master of the National Schools. At about the same time he joined the Devonshire Regiment (7th Cyclist Battalion) as a private, he was soon promoted to corporal and on 19 December 1913 was gazetted as second lieutenant. In November 1937 the newspaper reported that he was leaving Pinhoe School to take up the headship of Plymstock Senior School. At that point he was described as Mr Fred Jones MBE. In 1909 the daughter of Chudleigh newspaper printer, Miss Julia Rose Marguirite Emma Holcombe started work as an assistant to the Church Infant School Mistress. She was still in that role in June 1922 when she married Mr Arthur Page of Godalming, Surrey. Mr. Edwin Pole replaced Mr Fred Jones as headmaster in 1912 until probably the end of the first war. Mr. James (Jimmy) Webber followed Mr Edwin Pole as headmaster of the mixed school in 1919 having fought, and been gassed, in the war. Born in Tiverton in 1885 it is not known how he came to be in Chudleigh. He arrived with his wife, Beatrice whom he'd married at Tiverton in 1914. He was thirty-four years old, she was four years younger. They are recalled as having at least one son and lived throughout at the headmasters house just off Fore Street. On leaving Chudleigh (c1950) the couple moved to Exeter where Mrs Webber died in the summer of 1954. In August 1937 Mrs C R Elworthy, certificated schoolmistress, retired after thirty-seven and a half years service. She had come to Chudleigh from Cornwall in 1900. Since at least the mid-1850s the National School children were usually given an annual treat, either in the summer or at Christmas time. In 1938 their summer treat took place at The Lawns, courtesy of Sir George and Lady Hammick. This location was also used by the schoolchildren to celebrate the annual Empire Day. 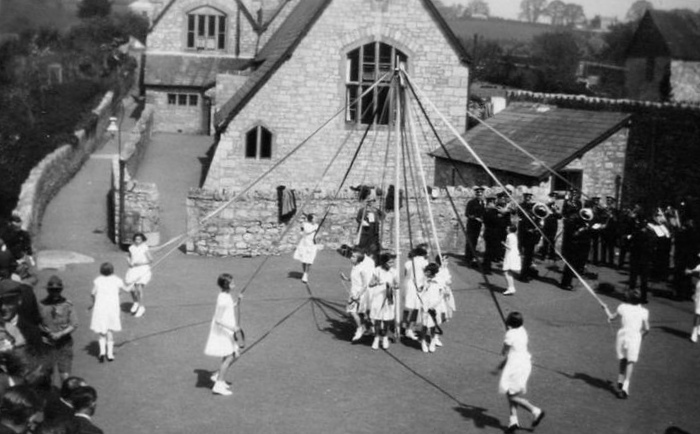 In March 1938 Devon County Council announced that it was their intention to amalgamate the infant school with the mixed school, a situation brought about by the retirement, through ill-health, of the headmistress of the infants, Miss E Riddett who had held the position for twenty-three years. Her leaving presentation attended by the school children, parents, friends and school managers took place in the school playground in early April. In early September 1939 the church school and its counterpart, the council school (the ex-Baptist school) were suddenly faced with a large influx of upwards of two hundred children from London who came to the town under the Government Evacuee Scheme. To accommodate all the children the two main buildings were used as far as practicable with the remainder using the church meeting rooms located in Parkway Road, a situation that continued throughout the remainder of the war. These meeting rooms were demolished in March 1981 and four houses called Parkway Mews were built on the site. The schoolchildren from London were accompanied by some of their teachers, one of whom, a Mr Palmer used to lodge at Heathfield Guest House on the Exeter Road. The headmaster of the time, Mr James Webber was able to utilise the additional older schoolboys in the afternoons on outdoor work at his market garden located in the grounds of Rock House. The house was, until the outbreak of war, a hotel but then subsequently put to use by the Americans – who had entered the war against Japan in 1941 – as accommodation for servicemen in early 1944 in the lead up to the practices at Slapton Sands in advance of what were to become known as the D-Day Landings at Normandy. September 1942 saw the start of provided school meals at lunchtimes. These were prepared at a canteen at Heathfield House and brought to the church school. At the first sitting there were sixty-nine children who were charged 5d a head. This facility was the first in the district and open to children of both the church and council schools. It was this arrangement that heralded the start of daily school meals. Up until that point only milk had been provided in the mornings and to access it the older children would walk to Town Mills where they would be served straight from churns. In early 1945 the council school at the top of New Exeter Street closed and the pupils transferred to the church school. With them came one female teacher, Miss Mabel Edwards. Her home was at 68 New Exeter Street which was until very recently (2010) named Mabel Cottage. The Ministry of Education confirmed the permanent closure of the council school during 1946. In the September of 1945 the senior pupils had transferred to Kingsteignton and Chudleigh school became a junior, and during the course of 1946 first termed a primary school. At the end of that year the education authority announced many changes to local schools. Chudleigh was to take on the children from Ideford School which was to be closed and also have nursery age children. The work to the building was to cost almost £20,000. In the event Ideford School did not close at that time and remained open there until 1974, althiugh the other changes went ahead. In 1948 the leaving age was raised to fifteen years and early that year improved dining facilities were introduced. £600 was borrowed for the work and the hall designed to seat one hundred and twenty-four children. The headmaster was still Mr James Webber at this point in time. In early 1949 Mrs Page (the married daughter of Mr Arthur Holcombe) retired from the primary school after thirty-six years, the headmaster, Mr Webber was one of those who paid a tribute to her effort. By the September the school was connected to mains electricity. Mr James Webber departed in about 1950 with wife and son. There is no mention in the Mid-Devon Advertiser of his retirement or departure from Chudleigh and this may be because he left under difficult circumstances. The same newspaper carried an item in February 1952 whereby a social was held at the school. It goes on to say that the headmaster, Mr B C Johnson entertained those present during the interval by showing slides on the newly purchased epidiascope (magic lantern), Mr Johnson lived in the school-house off Fore Street, in his time called 'Tireh' – being a place in Iran that probably Mr Johnson had spent time at during World War Two. During the war Mr Johnson had served with the Royal Engineers as an explosives officer and afterward, on returning to the Newton Abbot area he joined, in 1947, the Devon Cadet Battalion. He held the position of Captain and in early 1956 was promoted to Major. Since 1951 he had been Battalion Training Officer to the 4th Devon Cadet Battalion. His appointment to Major meant that he became responsible for training at summer camps and would advise battalions on training matters. Returning to school matters, the first Parent-Teacher Association AGM was held in September 1952 and so it seems that Mr Johnson had started at Chudleigh in 1950/51. The PTA organised many fund raising events during his time at the school and particularly in 1955 when a very successful pantomime was presented. With the money raised the PTA were able to purchase a new tape-recorder for the school. On leaving in the autumn of 1957 the newspaper stated Mr Johnson had been in Chudleigh eight years (1950) and had worked very hard for the school throughout that time. He left the school to take up a teaching post in South Africa. At his last PTA meeting he stressed the need for a new classroom as currently there were forty children per class. At that meeting a new teacher, Miss B Burns was welcomed to the school. The school was without a permanent headmaster for twelve months until the appointment of a successor in the summer of 1958. From the autumn term 1958 to 1976 the headmaster was Mr William (Bill) J Symes. He was welcomed to Chudleigh at the September 1958 PTA meeting by Mr L Raymont who said it had been a difficult year without a settled headmaster. Mr Symes lived for some while at the school house but later moved to a larger bungalow that was built for him in the Exeter Road (Cedar Gables), where he later died. The school house remained in church ownership (and still does) with all subsequent occupiers being tenants but no longer headmasters of the school. In 1972, during Bill Symes time at the school the leaving age was raised to sixteen years. Following Mr W J Symes was Mr Anthony (Tony) Gregg (of Paignton) who stayed about six years, then moving to a school at Totnes. Before the next headmaster was appointed Miss Lorna Vinton stood in as Deputy Head. From January 1984 the new headmaster was Mr Michael (Mike) L Tudor, aged 35 years. Miss Vinter then moved to the post of Deputy Head. Mr Tudor went on to hold the post for 25 years, retiring in July 2008. Studying at Birmingham University he had undertaken his teacher training at the College of St Mark and St John, Plymouth. Early on he taught at Camborne, Cornwall and later took the Deputy Head position at Ivybridge Junior School a position he held for four years. The school remained located off Fore Street until the Lawn Drive building was ready on 1 December 1991. The site used was previously fields belonging to Lawn Farm in Parkway Road. The new purpose-built school building was designed to accommodate 360 children but on opening only had 260. It had cost £1.85 million. 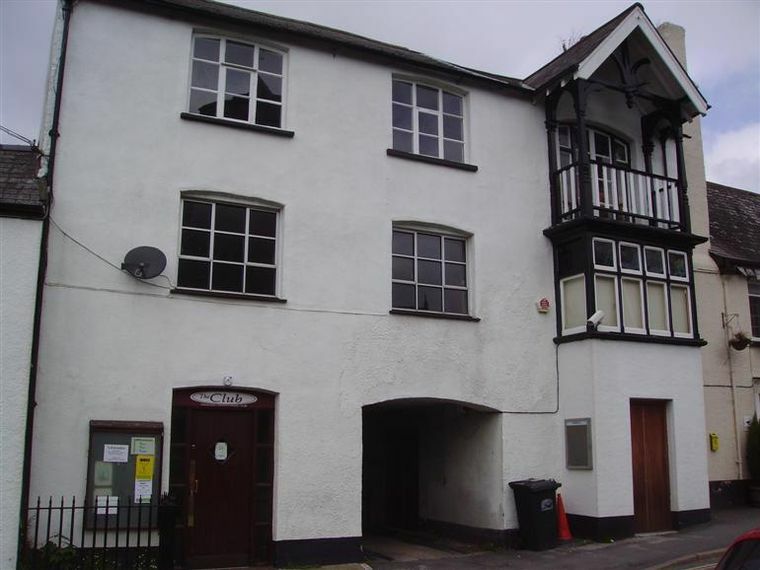 The old building remained empty for the next seven years until the youth club moved in May 1998 and the library three years later in November 2001. From 1 September 2008 the headmaster has been Mr David Barnett and the full school name is now Chudleigh C of E Community Primary School.